We are excited that you’ve expressed an interest in attending Lanesville Community Schools. This page will help you start the process of applying to attend Lanesville Community Schools for the 2019-2020 school year. If your child is enrolling in school for the first time and will be 5 years of age by August 1st, 2019 they will be enrolling in Kindergarten for the 2019-2020 school year and you should select Lanesville Elementary. If you are uncertain which school you need to apply to don’t hesitate to contact us at 812-952-2555 or 812-952-3000. If you have multiple children you will need to complete a separate application for each child at the appropriate school. Students currently enrolled at Lanesville do not need to reapply, you will confirm your enrollment and registration at a later time. To begin your application please click here. My child is currently enrolled at Lanesville. Do I need to apply during open enrollment? No. Current Lanesville students do not need to apply. Parents of current Lanesville students will hear more about registration over the summer. My child lives outside of Lanesville’s school district. May we apply? Yes. Lanesville welcomes out of district families. Out of district applications will be approved over the summer based on the number of available seats. My child is an out of district student. 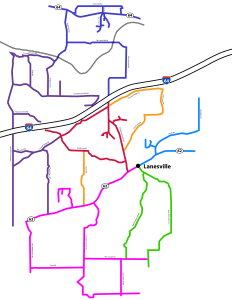 Will Lanesville provide transportation to and from school? No. If approved, out of district families should plan to provide their own transportation to and from the school. This could include making arrangements for student pick-up and drop-off at an address that is considered in district. How much is tuition at Lanesville? There is no tuition cost to attend Lanesville for any Indiana resident.